(45) Mens Vintage 1970s LEISURE JACKET! Pea Green w/ White Topstitching! 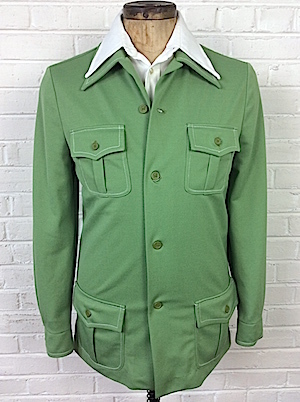 Home > Items just added 4/3-4/17 > (45) Mens Vintage 1970s LEISURE JACKET! Pea Green w/ White Topstitching! 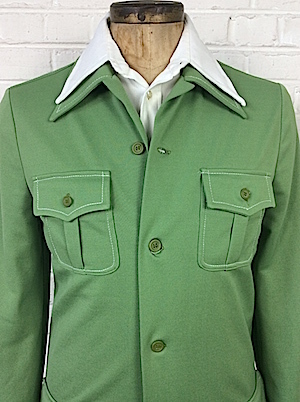 Mens Vintage 1970s polyester leisure jacket! 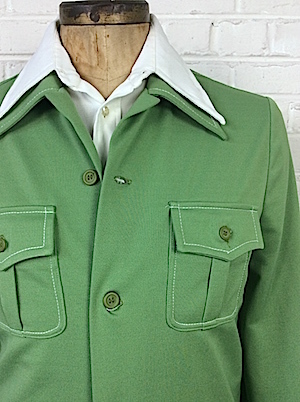 Catch some groovy vibes in this pea green leisure jacket with white topstitching! Jacket has a super wide disco era collar. Closes in the front with pea green colored buttons with one more on each cuff. Four patch pockets in the front with flap and button closures. Jacket is unlined. No material tag, but feels like 100% polyester. Sleeves: 33" collar to cuff / 26" shoulder seam to cuff.